Dawn Spencer Hurwitz has added two new fragrances to the Essence collection. St. Valentine (shown) ~ "Romance is in the air and we come bearing our most cherished tokens: violets, red roses and chocolate. 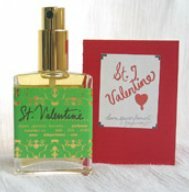 St. Valentine is an elixir of love... a sensual floriental-gourmand perfume of richness and grace." The notes feature bergamot, nutmeg, violet, rose absolute, raspberry, tea rose, amber, bourbon vanilla and dark chocolate. Pretty & Pink ~ "It's kind of soft, like a pink fuzzy Easter Bunny; kind of edgy, like a 1980's 'New Wave' look... Either way, we're entertaining our 'inner princess' with Pretty & Pink!". The notes include apple, French linden blossom, immortelle, lemon, apple blossom, rose absolute, mimosa, strawberry, sweet pea, heliotrope, honey beeswax, musk and sweet cream. Ugh. Seriously, to both. Some of her other perfumes sound good though. Has anyone tried the blonde suede? I've been in the mood for a nice leather. I love the packaging on the St Valentine, but never of them appeals to me either. Haven't tried Blond Suede, sorry! Well, I went to her site and looked around. She has extremely reasonable prices on her samples ($18 for your choice of 10, and that includes shipping) so I have some on the way! The prices are reasonable, and I like that DSH sells her scents in so many formats. I'd like to try her new “Perfumed Court” series. Mmmm, I saw that too – very tempting! I'm trying to keep my budget in check this year though. I know *just* enough about perfume now to be very dangerous with my credit cards! LOL!